Sets up the main parameters. 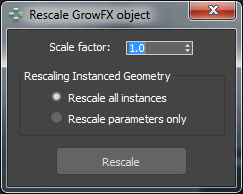 Opens an extra dialog Rescale GrowFX object, where you can rescale the entire GrowFX object. Specifies the scale calculation of some algorithms. When on, the system will create a simple cylindrical meshes instead of all Meta meshes. Use this option to more easily configure the tree with Meta mesh. Note: Do not forget to turn off when finish configuring the tree. When on, there is a possibility of GrowFX object converting to the Editable Mesh. Use this option in converting the object or in applying other modifiers on the object. When on, there is a possibility of GrowFX object converting to the Editable Spline. Use this option in converting the object or in applying other modifiers on the object. Disables the Progress bar dialog appearance during the calculation. When on, GrowFX uses the old algorithm to calculate the Graph of the Density in the Path distributors. When off, used a new improved algorithm. Default=off. If you open a file saved in the GrowFX old version, this checkbox will be enabled automatically. Specifies the number of divisions when evaluating Graph of the Density in the Path distributor algorithm. This parameter is used only for the old algorithm. Specifies a vector's size, in using Show vectors of path, the demonstrating of vectors directions and orientations all path points on the Main parameters rollout. When on, vertical edges will be visible on the Cylinder mesh. When on, there is a possibility to select the GrowFX object by clicking its mesh in the viewport. If possible hides the GrowFX object's icon, if there is a mesh, i.e. you can select the object by clicking on the mesh. It is active, when Selection mesh is on. When on, the random color for the Wire color is created when a new path is added. Allows to specify a color for highlighted lines, when the Highlighted paths mode is active. This group controls the basic limits for critical algorithms. Specifies the maximum number of segments for the paths lines, while editing the Length path or Steps on the Direction modifiers rollout. Specifies the maximum number of distributed lines, while editing the Density parameter in the Path distributor. Specifies the maximum number of distributed lines, while editing the Count parameter in the Distributor in point rollout of some distributor. Specifies the maximum number of faces around the circle for the Cylinder mesh. Also specifies the maximum number of faces on the leaf width for the Leaves mesh. Specifies the maximum number of vertices during the build Meta meshes. If some values exceed the specified limits, the system will display a message recommending change some settings to solve the problem. After that will be automatically enabled the Manual update mode. Opens the parameters rollouts in external windows. Opens the parameters rollouts on the command panel. Allows reset to default the positions and sizes of all windows of parameters. This group controls the display information in the GrowFX messages window. When on, displays the reports of creating paths and meshes, particularly the time spent for calculating. When on, displays additional information about the created paths. When on, displays additional information about the created meshes. Applies the scale to all instances used in the Instanced Geometry. Applies the scale only to the parameters. For all Instanced Geometry will rescale the Scale values.